With conversations ranging from relationships and family life to fitness and career, the June 2015 cover stories from some of our favorite Gen-Xers are bound to entice you far beyond their amazingly hot photos. Although lead times on print mags are often a couple of months out, it’ll still be well worth your time to check these issues out if you haven’t already! 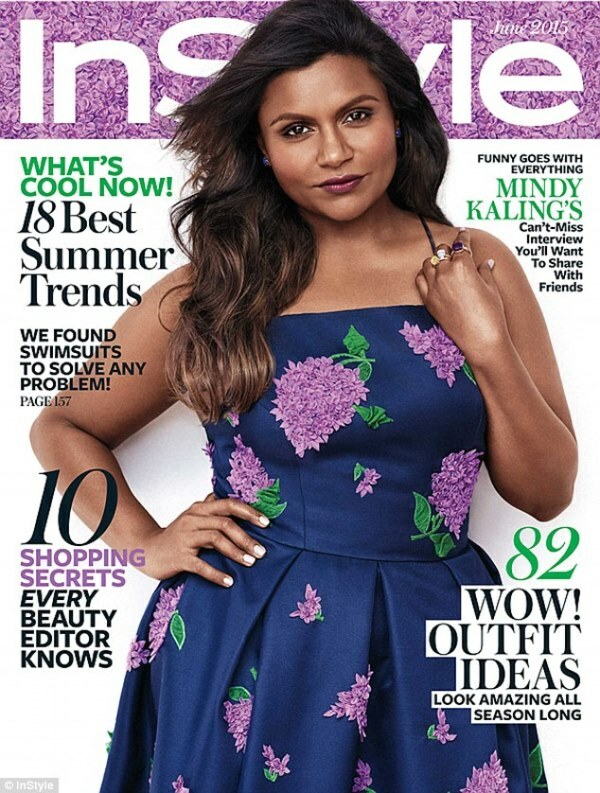 Mindy Kaling graces the cover of InStyle this month in a radiant blue and lavender dress. The writer and actress discusses her “it’s complicated” type of relationship with actor/writer and former The Office co-star B.J. 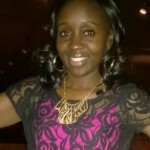 Novak, the death of her mother, and creating a family in the future. In other Mindy news, Hulu picked up 26 new episodes of her comedic show The Mindy Project which was recently dropped by Fox, and she will be releasing a new book Why Not Me this Fall. 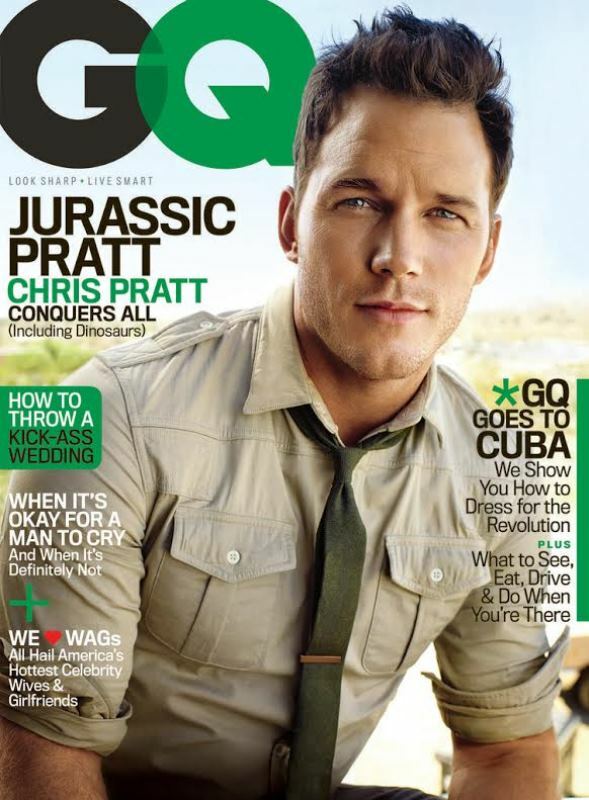 A very easy-on-the-eyes Chris Pratt adorns the cover of GQ in safari style colors in preparation for the upcoming film Jurassic World. Pratt confesses to GQ that he loves being naked, shares details about his relationship with his wife, actress Anna Faris, and describes what life was like before the fame. Elle UK chose my girl crush, the beautiful Charlize Theron, as the Summer kick-off cover girl. The Oscar award-winning actress stars in the critically acclaimed Mad Max: Fury Road alongside actor Tom Hardy. In this cover story, Theron talks about the gender pay gap in Hollywood, her relationship with Sean Penn, and much more. Theron is slated to star in the film Last Face, which is directed by her talented beau. 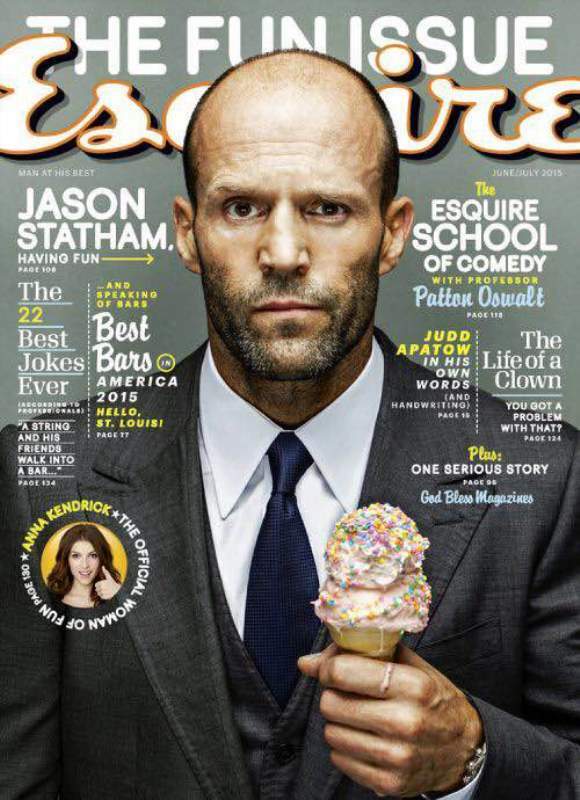 Esquire magazine’s “The Fun Issue” features none other than the stoically exciting British actor Jason Statham. In between all the fun, which included ice cream and mini train rides, Statham discusses his first career before Hollywood, why he isn’t drawn to comedy, and how he spends time with his girlfriend. Check out this action hero in his new comedic film Spy in theaters this month. Meanwhile, Esquire U.K. spotlights London-born DJ and record producer Mark Ronson, while the amazing Tom Hardy fronts the Singapore issue after nabbing the U.K. cover in May. Mommy-to-be Zooey Deschanel is the face of Cosmopolitan this month. In a candid interview, she dishes about her philosophy on success and posing for photos after she gives birth, among other topics. The star of the NBC hit series New Girl is currently awaiting the arrival of her baby with fiancé producer Jacob Pachenik. Additionally, you’ll find Gwen Stefani fronting issues in the U.K. and Russia Cosmo, and singer/songwriter Tatiana Okupnik on the cover in her home country, Poland. It’s The Rock, ladies and gentlemen! 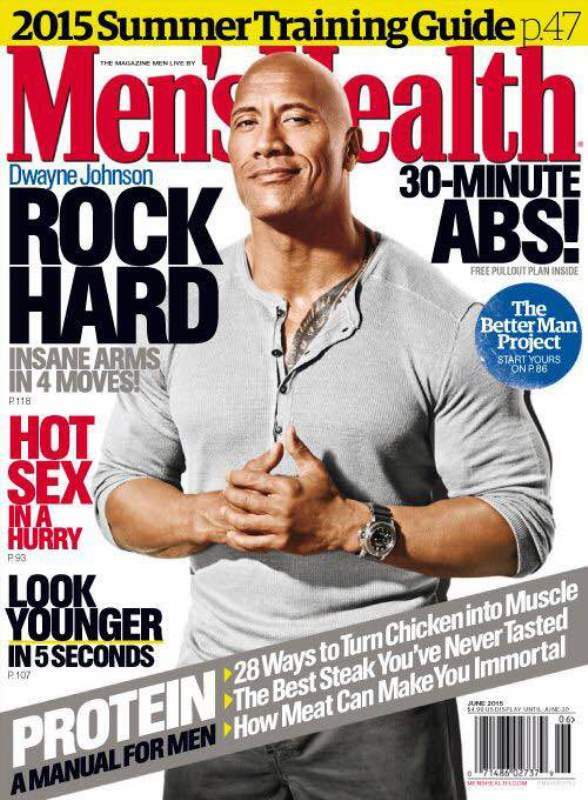 Of course Dwyane Johnson would be the perfect body to display on the cover of Men’s Health magazine. 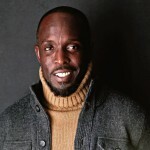 Johnson talks about his Rock-approved work out plan with tips for perfect arms, working with director Peter Berg on the new HBO series Ballers, and overcoming obstacles. His newest film San Andreas had an amazing debut in the box office with $18.2 million on its opening day. Jason Statham is also giving us a gun-show on the U.K. cover this month! Rachel McAdams, the Canadian born actress that wowed us in the film The Notebook, is on the cover of Marie Claire. McAdams talks with the classic magazine about her role in Season 2 of HBO’s True Detective, her break from the spotlight, and the type of roles she enjoys playing. Currently McAdams has three other films in the works, including Antoine Fuqua’s boxing drama Southpaw alongside Jake Gyllenhaal, Naomie Harris and 50 Cent. Marie Claire‘s U.K. edition is covered by Scandal star Kerry Washington (after she rocked the U.S. cover in March); while Anglo-French actress Charlotte Gainsbourg covers in France, and Marie Claire Greece features Mad Men‘s January Jones. 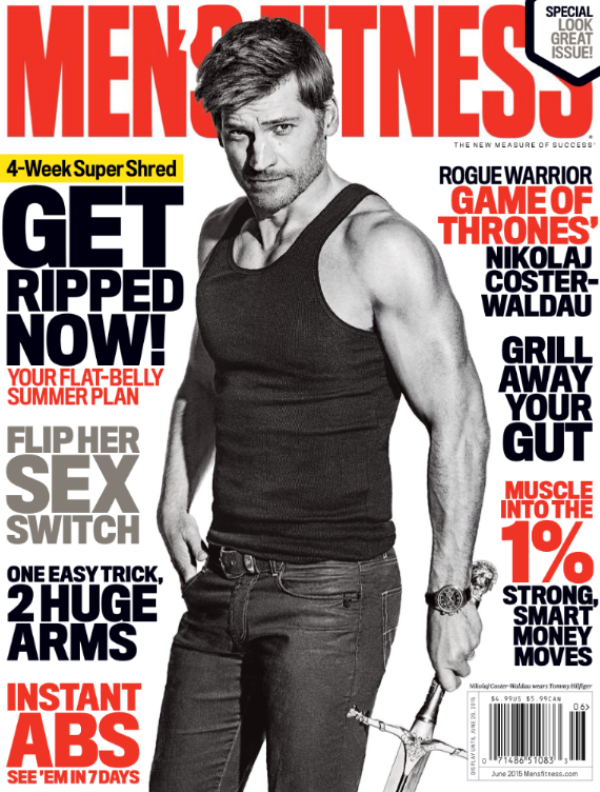 Jaime Lannister is known as the “King Slayer” on HBO’s Game of Thrones, but Danish actor Nikolaj Coster-Waldau is a stone-cold lady killer on this month’s cover of Men’s Fitness. In the exclusive interview, we find out more about his demanding GoT role, the best advice he’s ever received, and much more. The cover of Shape magazine has Jessica Alba showing off her swimsuit-ready physique. The entrepreneur and actress discusses the keys to a good workout, relieving stress, and finding self-love. Beside her acting career, the mom of two is busy running the billion-dollar business she co-founded, The Honest Company. Catch Alba back on the big screen as she makes a cameo in the new Entourage movie this month. Dean Devlin Instagrams An Image From The INDEPENDENCE DAY Sequel Set! !